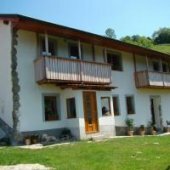 We are subletting a family house which acommodates up to 10 people in a lovely countryside near Bled, Bohinj, Ljubljana... You can rent individual apartments (comfortable three bedroom apartment with a spatious patio or a two bedroom apartment with modern furniture) or you can rent the whole house. Due to its idyllic location and the fact that the owners live elsewhere the house offers complete privacy and is perfect for active holidays. There is a barbeque area right in front of the house with an attractive playground for your children. It is possible for instance to bring tents and place them in the garden. A garden is also one of the big advantages of our property - you can simply bring your pets with you when you visit Slovenia.